I try to keep certain ingredients in my house for those times when i need to come up with a meal quickly. One of my easy go-to meals is this Easy Taco Ring. My family requests this often, and it is easily a household favorite I used to make it on a round cooking stone, but it has been misplaced. This works just fine on a cookie sheet. I originally got this recipe from The Pampered Chef, but have modified it a bit. Optional: Sour cream, red onions, lettuce, etc. 1. Cook hamburger meat with your favorite taco seasoning. Drain. 5. 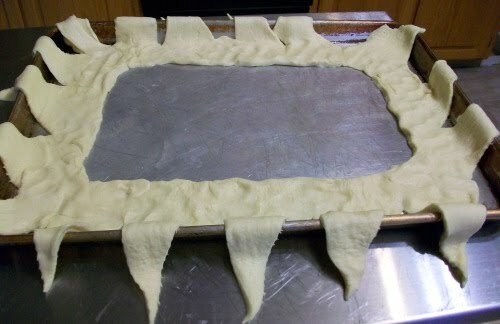 Bring the corners of each piece of dough over the top of the filling and press into dough on the inside. Make sure it is taut. 6. Bake at 350 degrees for about 30-40 minutes, or until cheese is melted and dough is lightly browned. You can be creative of course and add other ingredients inside! Slice into pieces and add a dollop of sour cream on each piece, and add any other goodies you want. 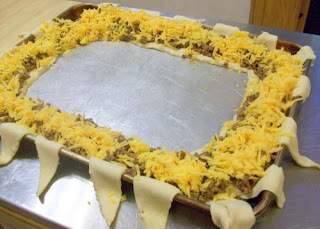 4 Responses to "Easy Taco Ring!" Hello? This is Jennifer. Elizabeth, would you like to come over for dinner tonight? 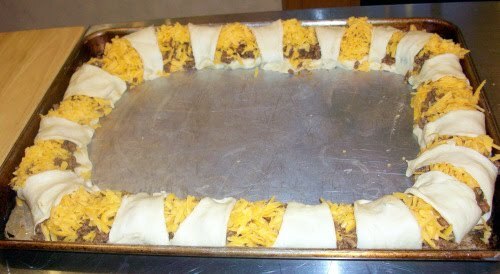 I just baked up a taco ring and thought of you. Why yes, I'd love to. Thank you! This is actually one of my kids favorites. I never knew how to make it (my husband's ex-wife makes this for her girls – who share with my boys… ) So guess who is gonna be a RAWKin Mom? Just guess – ME that's who all because of YOU! That is such a good idea! So you put the lettuce and tomatoes and mabye guac inside, like a big ol' salad? This looks and sounds yummy! I’ll definitely have to try this..